Browsing the discount DVD rack while doing a little last-minute shopping, I came across this collection of 9 Hitchcock films for a measly $8. I love Hitchcock, yet I haven't seen many of his films (and he was an extremely prolific director), so I picked it up. It turns out that all of the films on the DVDs are from Hitchcock's pre-Hollywood period, dating from the mid 1920s to the late 1930s. It even includes a 1927 silent film, among Hitchcock's first efforts, called The Lodger. By today's standards (or even the standards set by Hitchcock's later work), it's not especially impressive, but I haven't seen much in the way of silent films, so this particular movie intrigued me. The conventions of silent films are different enough from what we're all familiar with that it almost seems like a different medium. The film moves at a very deliberate pace, revealing information slowly in many varied ways (though, it seems, rarely through dialogue). In fact, I even played around with watching the film at 2X speed and didn't have any problem keeping up with what was happening on screen. 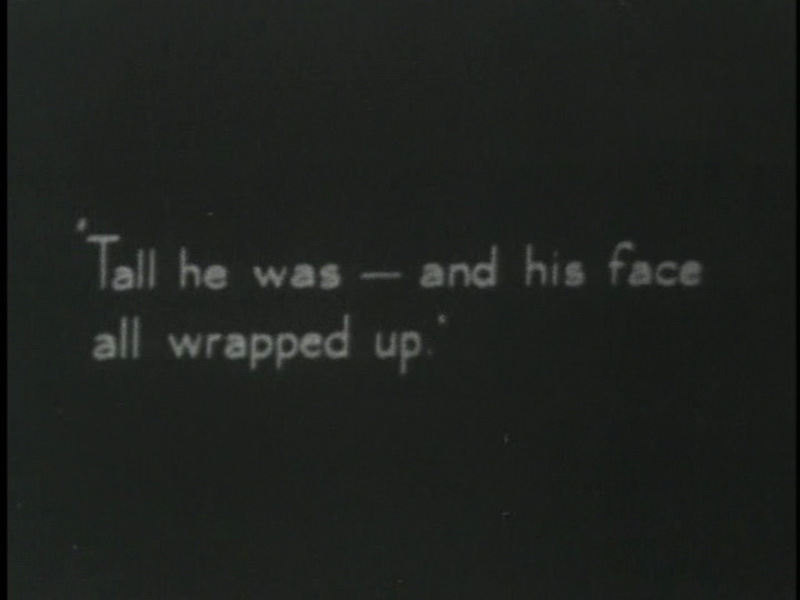 Not having any real experience with silent films, I don't know if this (or any other aspect of the movie) was unusual or not, but it seemed to work well enough. Details, screenshots, sarcasm and more below the fold. The killer had a long nose and floppy ears. From the Fog and the Constable, it's obvious London is under the grip of a Jack the Ripper style serial killer called "The Avenger." 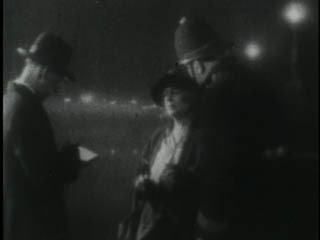 The film opens just after a murder with a lady describing our villain to the police. 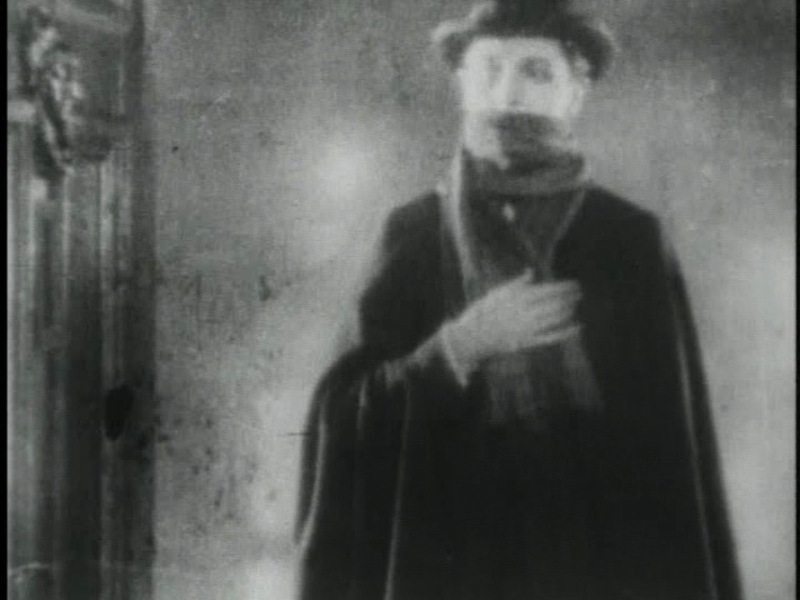 His lower face is covered by a scarf. The murders have occurred on sever successive Tuesdays. All of the victims were fair-haired women. 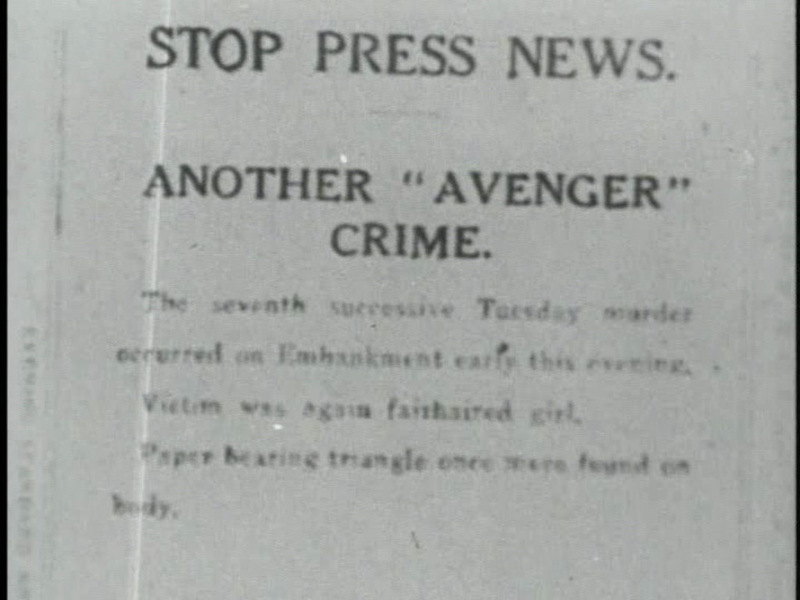 The killer leaves a calling card bearing his name (The Avenger) with each victim. 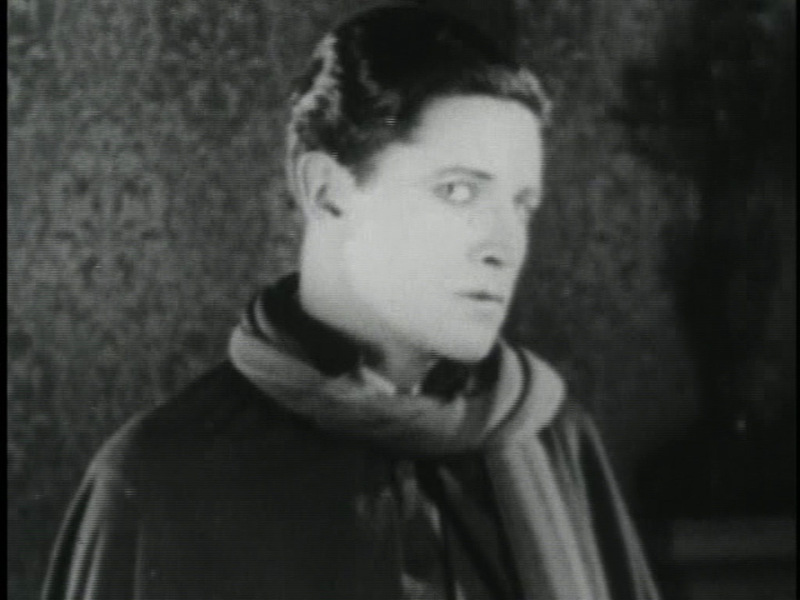 Excellent reveal of the Lodger. 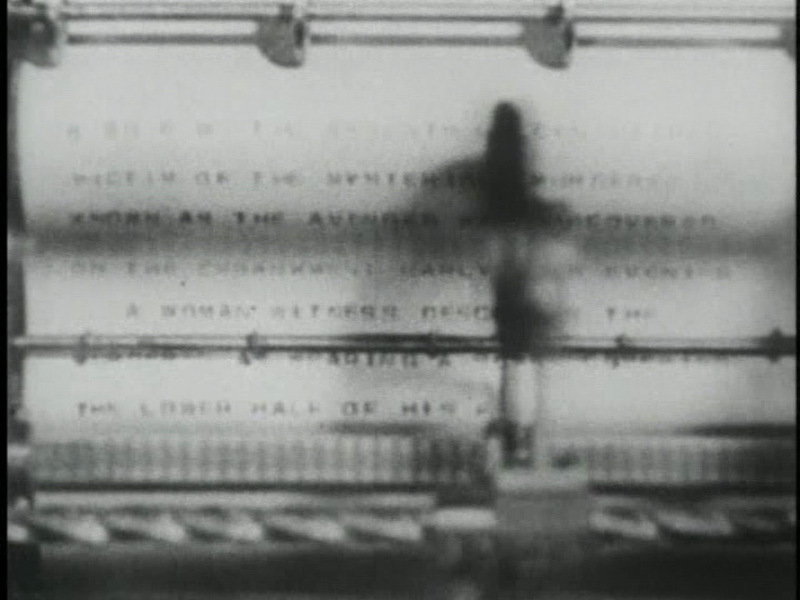 I think this is the most striking image in the film, and it immediately set off warning bells in my head. No, really, I'm not the Avenger! See, without my hat and scarf, I'm much creepier. Woops, I mean less creepier. Yeah. You gonna get it, woman! 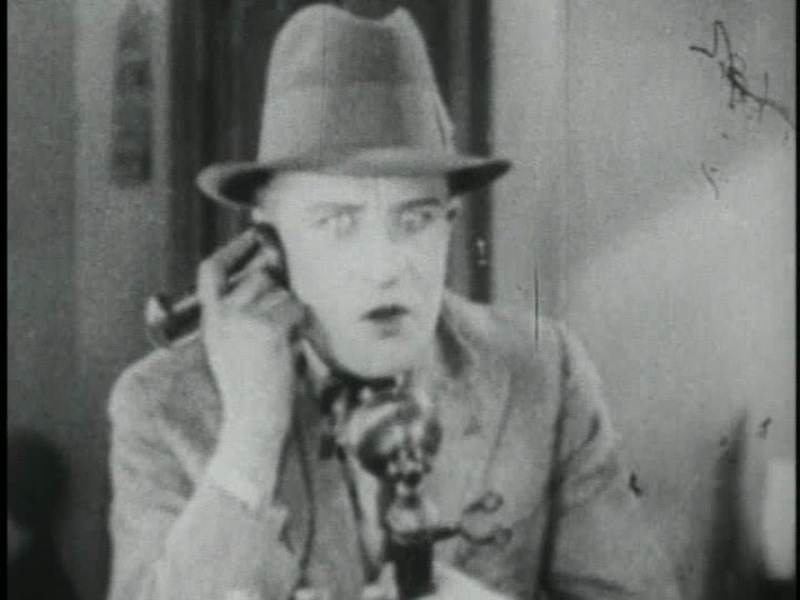 Oh, and despite the fact that the Lodger is clearly a psychopath, Daisy is falling for him, much to the dismay of Joe, her policeman friend (who happens to be investigating some series of murders or something). The characters in the film have finally figured out that the new lodger is The Avenger, and policeman Joe searches the premesis and finds a hidden bag in his room containing a map of all the killings, various newspaper clippings, and a photograph of the oddball with one of the victims. Our villain is handcuffed but promptly escapes with the help of Daisy (who thinks he's innocent, of course). "My God, he is innocent! The real Avenger was taken red-handed ten minutes ago." Ah Ha! Hitchcock strikes again. In case you can't tell from all the sarcasm, the "twist" at the end of the story wasn't exactly earth-shattering. These days, we're so zonked out on Lost and 24 that our minds immediately and cynically formulate all the ways the filmmakers are trying to trick us. Were audiences that cynical 80 years ago? Or did the ending truly surprise them? To be honest, there was a part of me that thought that he really could have been the killer. Also, as I hinted at above, this film seems to resemble film noir, and the angry mob scene was somewhat effective in that light. Ultimately, I enjoyed the film greatly, even if much of my fascination has to do with the context and conventions of silent films. This was apparently the first film where Hitchcock really displayed his own style, and you really can see a lot of themes in this film that would later become Hitchcock staples (i.e. the wrongly accused man, voyeurism, etc...). 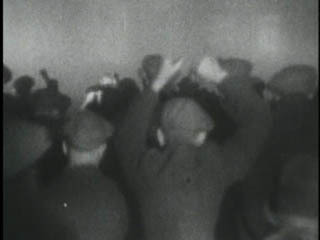 More on the background of the film can be found at this Wikipedia entry. So one film down, eight to go. I have to admit, part of the inspiration to get this set is that Cinecast is currently doing a Hitchcock marathon, though it seems that the only film on their list that is in this DVD set is The 39 Steps.